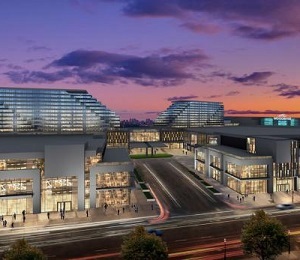 Construction appears to be drawing closer for a multi-phase redevelopment of the sprawling 684-acre Woodbine Racetrack property in northwest Toronto now known as Woodbine Districts. The property is actually larger than Toronto’s downtown Central Business District. Rezoning and site plan approval submissions have now been filed with the City of Toronto, after its Design Review Panel was able to review and comment on proposals for the site in November. The Design Review Panel is comprised of architects, landscape architects, urban designers and engineers who provide independent and objective advice to city staff that’s aimed at improving matters of design that affect the public realm. This includes such things as preserving the uniqueness of a place, maintaining vitality, ensuring comfort and safety, and making a new development compatible with its surroundings. “It was very constructive feedback, and much of their recommendations have now been inserted into our plans and our vision,” said Max Reim, co-managing partner and principal of Live Work Learn Play, which has partnered with Woodbine Entertainment Group on the development for the past three years. Reim also said substantial outreach has been done with dozens of stakeholders and community feedback has also been very encouraging. Woodbine Racetrack is ideally located in northwest Toronto (population approximately 2.6 million), surrounded by the growing municipalities of Yo​rk (population approximately 1.1 million) and Peel (population approximately 1.3 million). Architectural plans and renderings for the master-planned community have now been filed, and the plan is to leave about 200 acres of the site dedicated to horse racing operations. For those who don’t play the ponies, however, there are plans for plenty of additions to a property larger than downtown Toronto’s business district.